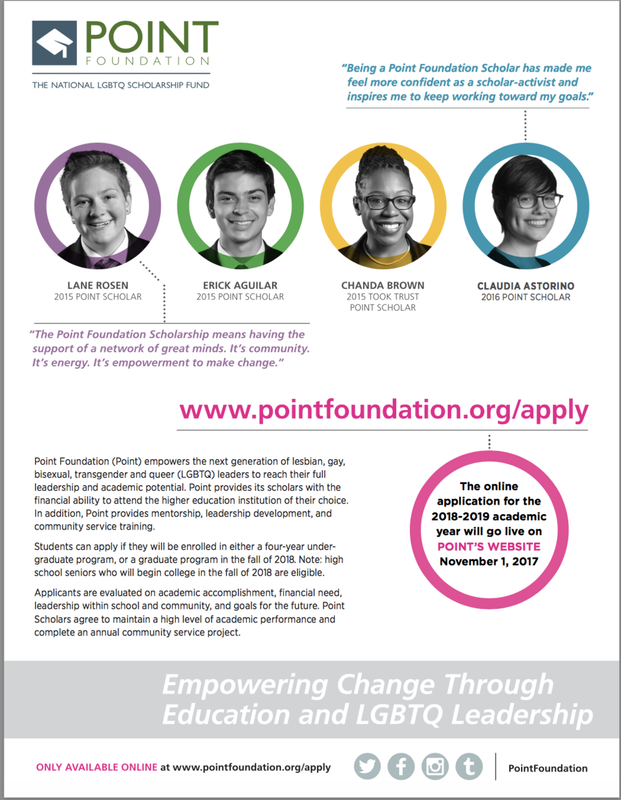 Point Foundation's scholarship for LGBTQ undergraduate and graduate students is now open! Point Foundation’s scholarship for LGBTQ undergraduate and graduate students is now open! The application period for our 2018-2019 higher education scholarships opened November 1 and remains open until January 29, 2017. If your organization could share information about the scholarship opportunity with constituents that would be wonderful. Download official entry form and rules here. A safe space is not just a triangle-rainbow sticker on the door to our Library at Camden Hills Regional High School (CHRHS)! We strive to create a comfortable, welcoming destination where students and teachers get friendly service, help with technology, book recommendations, research support, and more. We have our new books on display in various places in the library, but we also like to create displays around themes to raise awareness. In honor of the Day of Silence, I worked with our GSTA to create a library display to complement the information table they were hosting in the school atrium. The students provided some of the signage for the display and provided written resources to accompany the books. 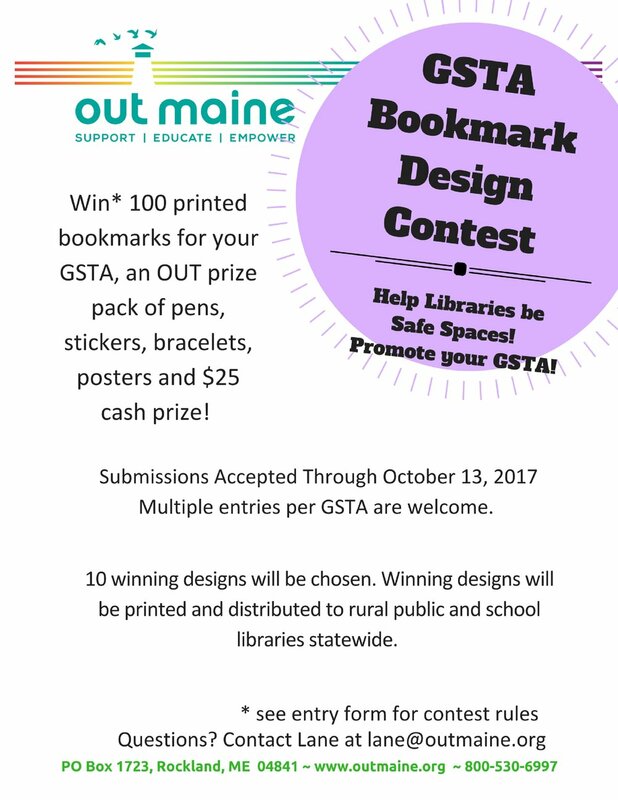 This summer I planned out a calendar of themed displays for the year, including some that honor LGBTQ+ culture, and will work closely with the GSTA to include their input, ideas, and creativity. Libraries are sometimes referred to as “third spaces” -- a place you can choose to be outside of school/work or home. At CHRHS, the library is a place students choose to come for a variety of reasons. Sometimes it’s to socialize with friends, work on a group project, play a board game, or do homework together, but other times the library is a place where students come to work alone, listen to music, relax with one of our community knitting projects, or read. Some students prefer to eat their lunch in the library rather than in the cafeteria. Remembering my own anxiety about eating in the noisy lunchroom, I advocated strongly for this with our administration and custodial staff. Not just for our LGBTQ+ community, but for our anxious students, those who can’t stand the noise or over-crowding, and for those introverts among us, having an alternative place to eat is responsive to student needs. Does this mean that sometimes I have to ask students to pick up after themselves, or sweep up some crumbs after they leave? Yes. We have a library broom now! But it’s absolutely worth it, because it really makes a difference for our students. The CHRHS library’s book collection needed a lot of help when I first came on board: there were many books that were old and outdated, collection areas that needed upgrades, as well as “holes” in the collection that needed to be cultivated. I saw a gap in our informational resources about LGBTQ+ health, culture, and history, but also in our fiction books. The great news is that there has been a recent publishing trend towards more young adult fiction that features LGBTQ+ protagonists, as well as nonfiction informational texts. When I am reading reviews in journals or online, I’m always keeping an eye out for books that realistically portray a variety of perspectives: I want to have something for everyone, a book where the protagonist might be like me, or not at all like me. The act of reading builds our empathy for the experiences of others, but it can also be such a thrill to find a kindred spirit in the pages of a book! Particularly for our students who may be questioning or in the process of coming to terms with their own sexuality or gender, having a robust collection of library resources is a way of acknowledging that they matter, and that their experience matters. One of the concerns we have in libraries is “labelling” books in a way that might discourage a reader from forming their own judgment about the material, or potentially drawing unwanted attention to the content of the book. A rainbow sticker on the spine of a book with LGBTQ+ information or themes might make it easier to find for someone who is browsing the shelves. But would that same rainbow sticker be a deterrent to another reader, someone who might be less comfortable with others knowing they were reading a “rainbow sticker” book, regardless of their own orientation/identity? I’ve erred on the side of protecting readers’ privacy, so we don’t label our books. Students can ask for help, use the digital card catalog, or navigate the collection using signs on the endcaps of the shelves to find books on their own (we use natural language words like “Sexuality” or “Civil Rights” in addition to the Dewey numbers). Last spring, one of our lunchtime “regulars” came in and asked me for some recommendations about a book about being transgender. Without missing a beat, I asked a clarifying question: was the reader was interested in factual information about being trans or a memoir about being trans, or a story or novel about being trans? The reader was looking for a novel --- so we zipped around the fiction section and grabbed four titles. I gave the reader a mini-booktalk on each, and the reader selected I am J by Cris Beam (2012). I was honored that the student felt comfortable asking me this question. And I was equally glad that our library had a variety of contemporary choices to offer.